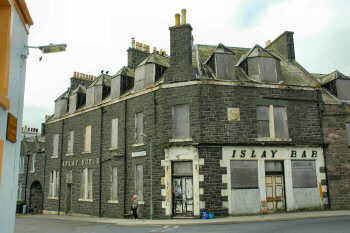 Last night I heard something from Islay I almost wasn't expecting to hear any more after all the delays over the last months and years: I'm told the redevelopment of the Islay Hotel in Port Ellen is due to start on Thursday this week. I think everyone will agree that with the state the building is in now this is far far overdue, it is really an eyesore in its prominent position in Port Ellen. Not a very nice welcome to Islay. I'm quite sure it also contributed heavily to the bad impression Adrian had of Port Ellen during his visit to Islay. As far as I know the building will be demolished, as the Building at Risk Register for Scotland describes it is in a very bad state. Probably far too expensive and time consuming to attempt a repair. Either way, I believe the new Islay Hotel will be a huge asset to Islay once completed and give a big boost to Port Ellen. With its location virtually next to the ferry terminal and close to three of Islay's famous distilleries there shouldn't be a problem filling the rooms, which will benefit Port Ellen in various ways. 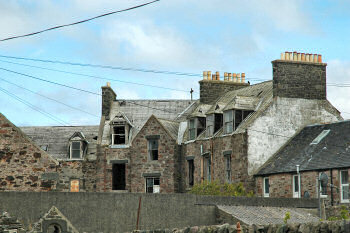 Who knows, may be Adrian will return to Islay one day, stay in the new hotel and change his opinion of Port Ellen?